The fifth quilt block in the series is simply called the "Star". It was paper pieced. I really enjoyed the process but for some reason my block measures at 11.5" and it should measure 12.5". I'm not worried, I will add a bit of white and cut it to size. No point in wasting a good block. I've learned after all these years of quilting and knitting, there are ways to make things work and no one knows but you. The Amish actually put a mistake in their quilting on purpose because God is the only one who is perfect. I don't have to purposely place a mistake, they manage to spring up all on their own! I've been working on a project that is now starting to take shape. I'm currently redoing the Pretty Room. This picture above is what is has looked like for the past eight years. I have been feeling the need to pair down and simplify my home and other aspects of my life. I've been thinking a lot about growing up on Lake Michigan and how that has shaped me. So I decided to head to a more beachy calm, cottage feeling. So with that in mind, my daughter and I painted the room this soft shade of grey blue. We left the Bible verse as I love it so. Today two chairs were delivered that I have been waiting on for weeks now. This slip-covered, washable fabric is just as I had dreamed. A new couch will arrive next week. 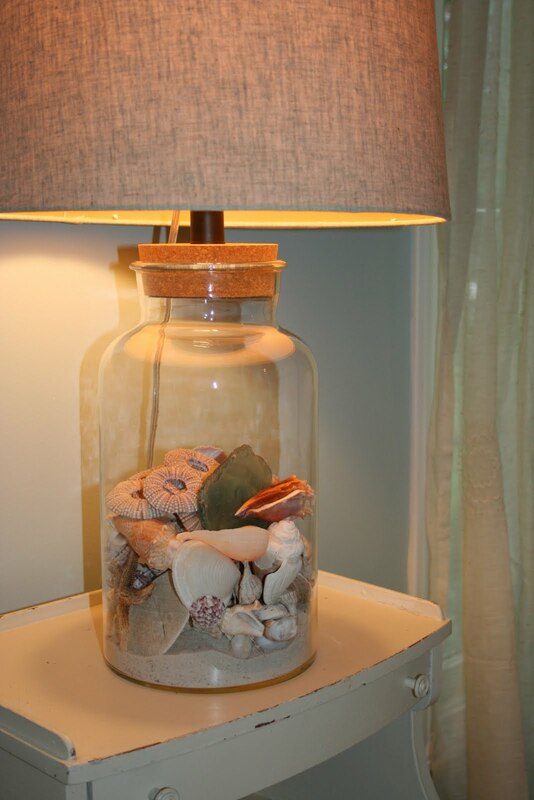 I found this lamp at T.J. Maxx and filled it with sand and shells from our trips to Siesta Key, Florida. It casts the loveliest warm glow in the room. I started looking around and found other things I could pull into the room from different parts of the house. This dish was on the porch and I put beach glass and pottery that my brothers and I found on the shores while we were growing up. The rest of the beach glass has found it's way into a jar I found at T.J.'s as well. A moved the shell from upstairs to the mantle and continued my search. 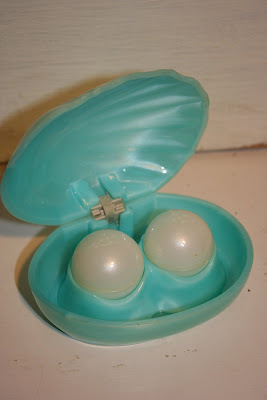 These two beauties were hanging out upstairs, part of the collection of salt and pepper shakers that my daughter has. I knew I could find a new home for them. 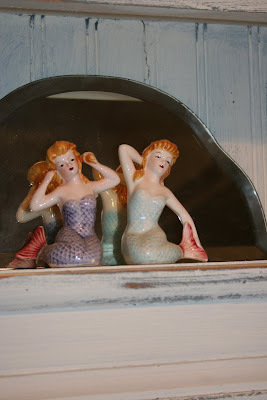 The mermaids landed next to this cute salt and pepper clam set that I found on a recent trip to the town I grew up in. 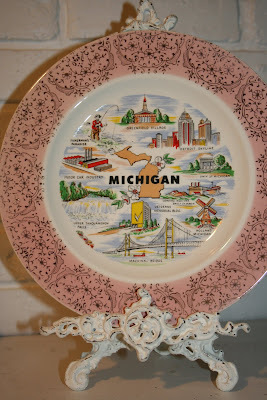 I had to include this plate as well. So many of the places listed I have been to at some point in my life. There is still a lot to be done. The ottomans are getting a new slip cover when I can fit that in. I have a quilt in mind to hang on the wall, I just have to make it! I also have a cabinet to paint as well as a little doll chair. 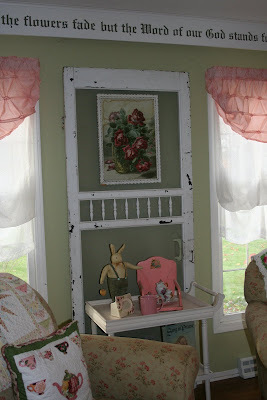 I'm keeping my pink coffee table and shelf in the room but most pink touches will be subtle. It's fun to go slow and take my time. I will share more when I get things done. Blessings! your room is looking perfectly 'put together', renee. love the new color and your two new slip-covered chairs. it looks like a very restful/peaceful space. Your block is great. Wonder why the difference in size. Maybe something to do with the paper piecing. I love all things beachy, so your Pretty Room transformation really got to me. You made it seem like an smooth transition. Can't wait to see the couch. Your room is coming along well! It's nice that you're putting out things that remind you of sweet memories. It's fun to have a theme. That salt and pepper set is awesome! I love your block, even if it is smaller than you intended. I know you can make it work. I get it about letting things go. Less is more. :o) It feels so nice to keep things orderly and I struggle when I have too much stuff. Your quilt blocks are amazing Renee! 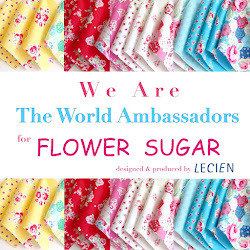 So pretty and such a beautiful quilt they will make. :o) I am just beginning to tuck a few tricks up my sleeve to "fix" things when I goof in sewing. :o) It is not so scary anymore. Have a wonderful weekend friend. 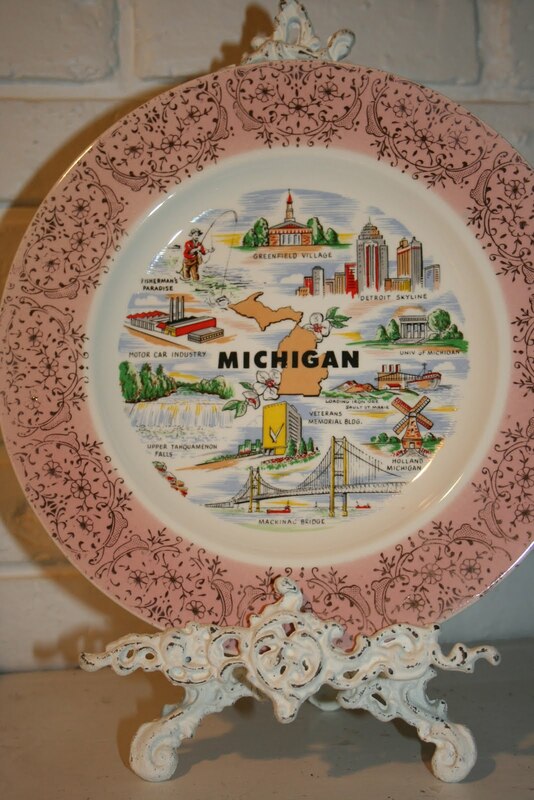 I also grew up right on Lake Michigan, well 26 blocks from the lake, but really felt like more of a city girl that was supposed to be in the country. I am reminded by your post to go visit the lakeshore more often as it is a treasure that is sadely often forgotten. I think your quilt square is wonderful, and who cares about the size difference. Just improvise, like you said. Most quilters end up measuring and trimming down once all the squares are done anyhow. 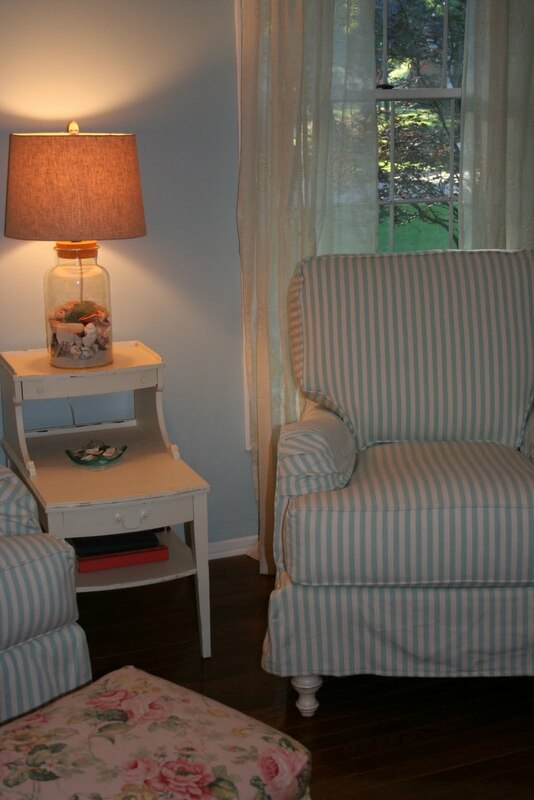 It looks so calming and I love the chairs and slipcovers. It's amazing how I don't mind waiting for the process of decorating to happen now as I've matured. There was a time I could finish a room in a weekend. Pretty block, too. I love the new look. 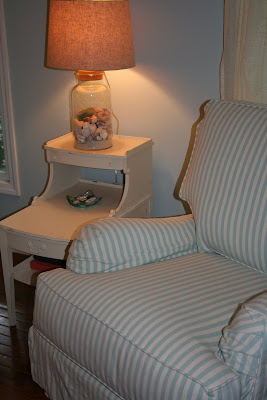 I love a beachy, cottage look. I have some beachy things in one of my bathrooms. My favorite thing in there is a picture of a bike in the sand at the beach. Your pretty room is going to be even prettier! I love the beach theme! The striped slipcovers are perfect. This looks really nice! But then everything you touch seems to. Have a great weekend.